My friend Ashlyn and her husband have incredibly green thumbs. 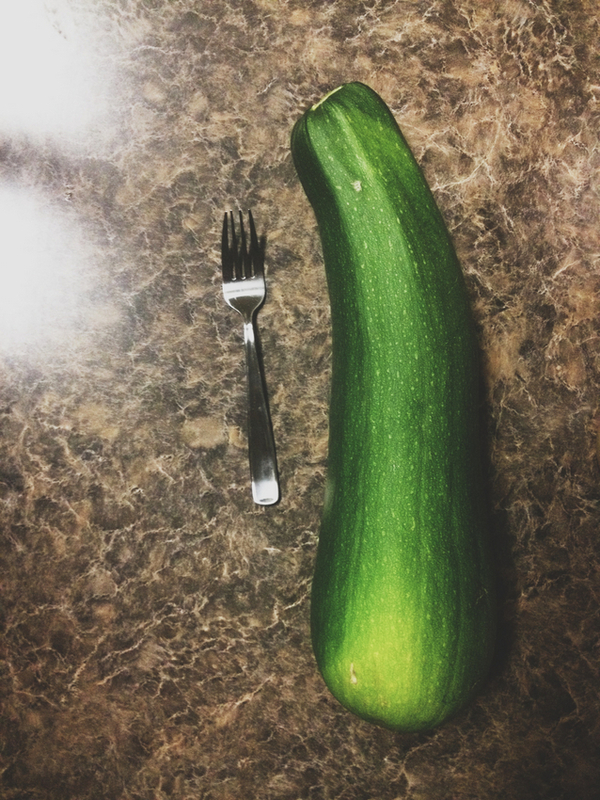 Even though it's their first time planting and growing a garden, they've managed to produce massive amounts of squash, cucumbers, tomatoes, jalapenos, basil, and the largest zucchinis I've ever seen. For real? I know. That's a normal sized fork! I had no other choice but to make delicious muffins. Definitely the best muffins I've ever made. - Preheat the oven to 325°. - Combine flour, sugar, baking soda, and salt in a large bowl. Whisk together. - In a medium bowl, mix egg, vanilla, melted butter, apple sauce & zucchini. - Add wet mixture to the flour mixture and stir until just blended. - Bake for about 20 - 25 minutes, although I recommend checking about half way through. Bonus: If you make 12 muffins, they each have about 175 calories. Perfect to bake up a big batch, freeze, and microwave for breakfast on the go! They look delish! I am having some definate garden envy! I am still waiting on my first tomatos of the season!